← Well, I'll Be Damned. No, the first one isn’t finished, but I like variety, changing things up, doing more than one thing at once. 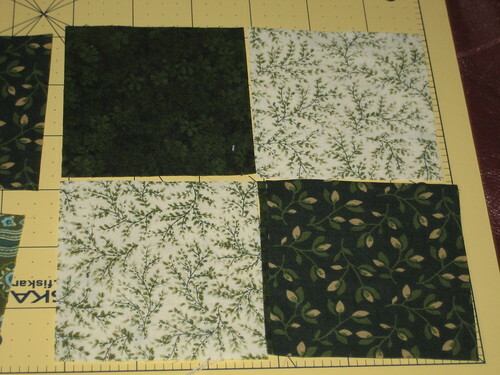 I’m really excited about this one, because I found some positively fantastic fabrics for it. My favorite, a gorgeous light green stripe, is proving to be the most difficult to work with, though, as the stripes certainly point out when a cut has gone awry. 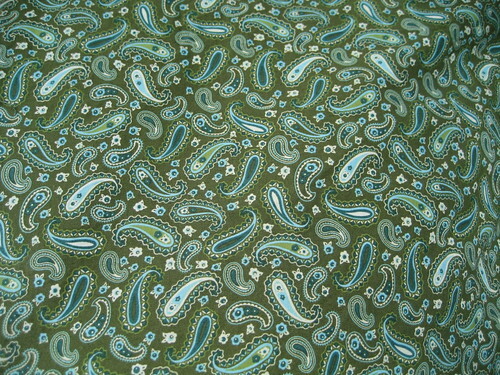 One of the fabrics, a green paisley, is definitely something I had to stop twice (ok, four times) and think about. It’s something I winced at on first glance, but then remembered to think small/large. I can’t imagine much square footage of that mess, but tiny bits of it, perhaps. I’m planning to do a four-patch design… or maybe a nine-patch. 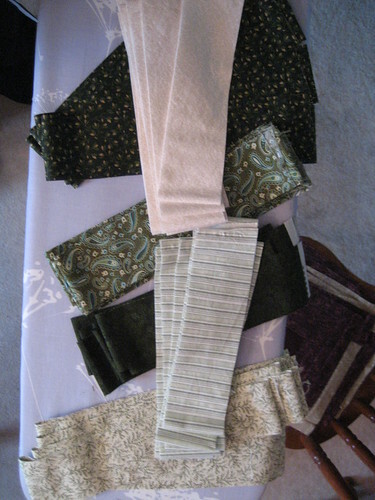 I have six fabrics I intended for it, but have to figure out how to arrange them. 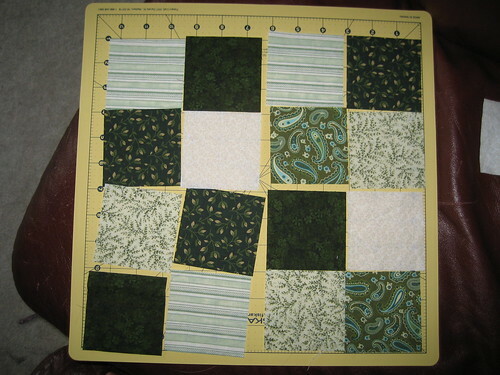 I can’t seem to find a “six-patch” pattern, which seems odd, but I’m sure there’s perfectly sound reasoning behind it. Ohh, purty. You know what you’re doing right? 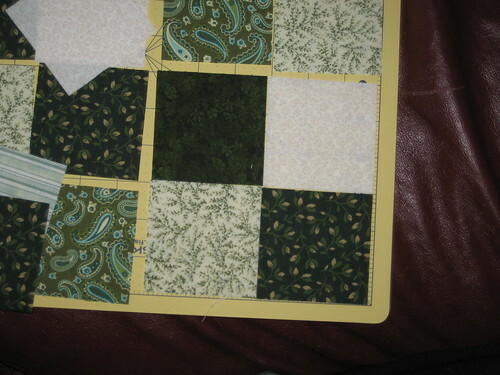 you’re making me drool here and pretty soon I’m gonna wanna start quilting too. Bahahahaha!!! My grand scheme, it is working! Also, I’ll stop commenting on my own post now. I think I already found the sewing machine I want, too..
Oh, nice! Looks fabulous. If it doesn’t come with a 1/4″ foot, grab one of those, too – makes this whole “seam allowance” thing easier. Do you already know how to sew? It looks like I can buy a 1/4″ foot separately from a sewing shop that will work. I took a semester of sewing in 8th grade.. *gulp* 17 years ago. I did pretty well if I recall correctly, I still have one project I made which was a duffel bag made out of a dark purple printed corduroy. We’re in the same boat. But you’re in luck! I can already show you how to do tons of stuff, like cut fabric into the wrong sizes and sew really, really crooked seams.